Holiday Baking ~ Learn, Live, and Explore! There are two times in the year that I love when it comes to food: fresh strawberry picking season and the cinnamon, nutmeg, nuttiness of holiday baking. 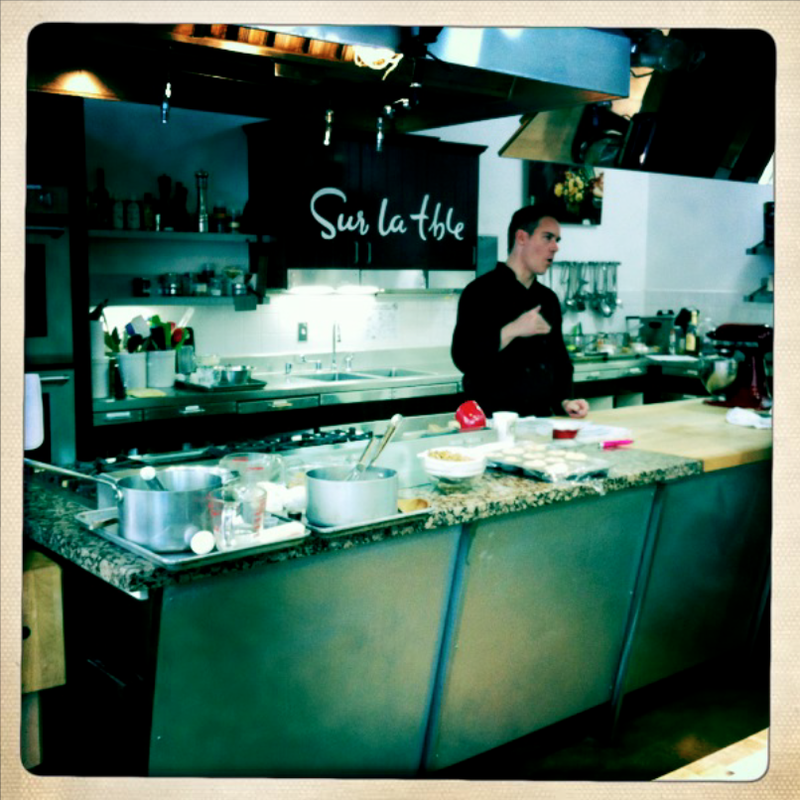 Always eager to learn new recipes, I signed up for a baking class down the street at my local Sur la Table store. The cooking classes offered through this company are small, convenient, and relevant to the average home chef. 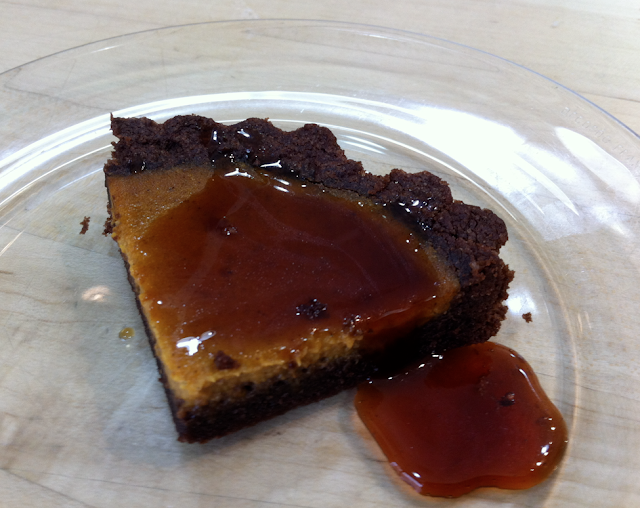 I wasn't wild about the tart and the pie, but that's just me and my taste preferences. If it's not a big heaping pile of cinnamon and sugar coated apples filling that pie crust, I'm not likely to dive in. 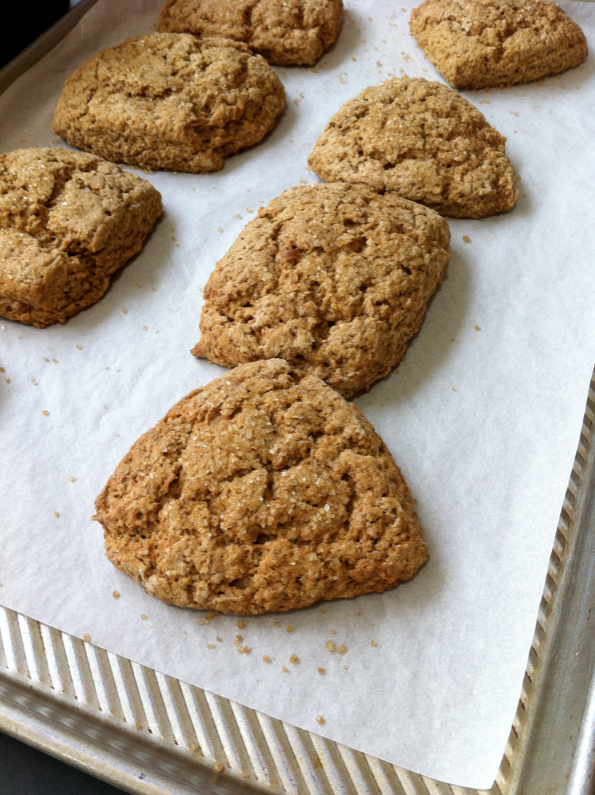 The gingerbread scones, though, were amazing -- even better than my standard Starbucks Cinnamon Chip Scone. 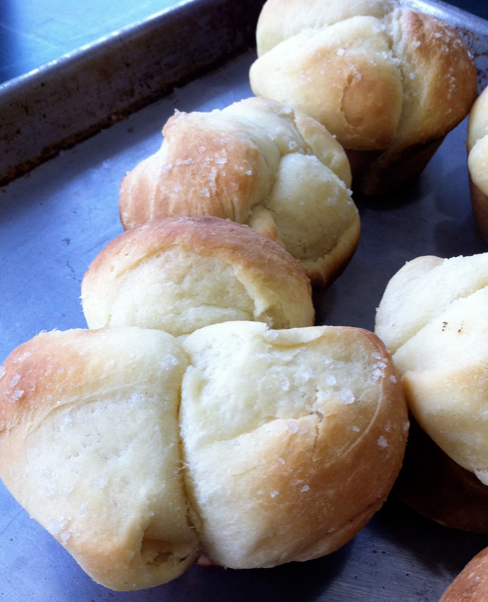 Then the Cloverleaf Dinner Rolls drowned in butter and sprinkled with course salt before baking - whoa!! Put the quartered potato in a small saucepan, cover with water, and set over medium heat. Bring to a simmer and cook for 15-20 minutes, until the tip of a paring knife slides in and out easily. Drain well, reserving 1/4 cup of the cooking water. Return the potato to the pan and mash using a potato masher or fork. Set aside to cool to room temperature. Warm the reserved potato water to 110 to 115 degrees and pour into the bowl of a stand mixer fitted with the paddle attachment. Add the yeast and 1 teaspoon of the sugar and whisk by hand to blend. Allow the mixture to sit for 10 minutes, or until the yeast is activated and foamy or bubbling. Measure 1/2 cup (3 1/2 ounces) mashed potatoes and add to the bowl. Add the remaining sugar, softened butter, milk, and egg and whisk by hand until well blended. Add the flour and kosher salt and knead on low speed for 2-3 minutes, until the dough begins to come together. It will seem sticky. With the mixer on low, add additional flour, a tablespoon at a time, until the dough begins to pull away from the sides of the bowl. Turn the speed on medium-low and continue to knead until the dough feels firm, dense, and springy - about 5 or 6 minutes. Note: This dough is soft and sticky and will not pull away from the sides completely. Do not overknead or the starch from the potato will break down and make the dough gooey. Lightly butter or oil a plastic tub or a large mixing bowl, scrape the dough into the tub, and lightly coat the surface of the dough with a little butter or oil. Cover with plastic wrap or a damp lint-free cotton towel, and let the dough rise until doubled in size (45-60 min, longer if the room is cold). If you are using a tub, be sure to mark the starting level of the dough with a pencil or piece of tape so it's easy to tell when the dough has doubled. Turn the dough out onto a lightly floured surface. Press down the dough firmly to expel some of the air bubbles. Chill, covered, for at least 2 hours and up to overnight, until the dough is very cold. Butter the cups of a standard muffin or cupcake pan. 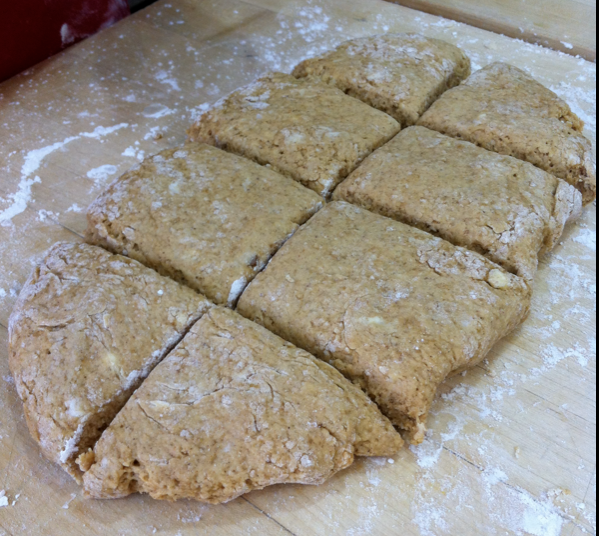 Cut the dough into 10 even portions (approx. 1/3 cup or 3 ounces). Then cut each portion into 3 equal pieces. Form each piece into a ball and nestle 3 balls into each muffin cup. Cover the rolls loosely with plastic wrap or a damp lint-free cotton towel and let rise until almost double in size (35-45 minutes, longer in cold room). Preheat the oven to 375 degrees and place a rack in the center. 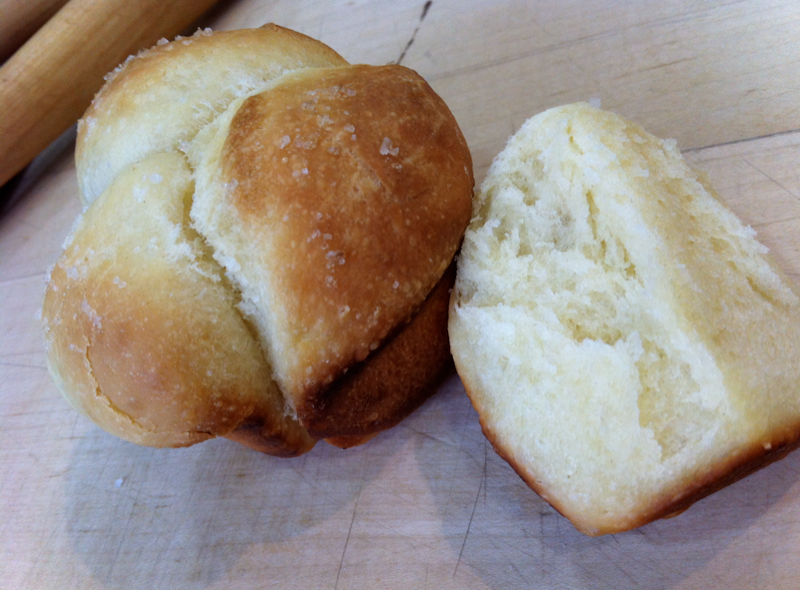 Brush the tops of each roll, generously, with melted butter and sprinkle lightly with fleur de sel. Transfer rolls to preheated oven and bake for 15 minutes. Rotate the pan and continue to bake until the rolls are golden brown and their internal temperature registers 200 degrees on an instant read thermometer, about 15-20 minutes longer. Transfer rolls to a cooling rack and serve warm or at room temperature. Preheat oven to 425 degrees and place rack in center. Line a rimmed baking sheet with parchment paper or a thin silicone mat. Place the dry ingredients (flour, sugar, ginger, cinnamon, cloves, baking powder, baking soda, and salt) in the bowl of the food processor and process for 15 seconds to blend well. Add the cold butter pieces and pulse 5 times at 1 second intervals, or until the butter is cut into medium pieces. Pour in the buttermilk and molasses, all at once, and pulse another 20 times, or until the dough holds together in large, thick clumps. Use a spatula to scrape the dough out onto a lightly floured work surface. 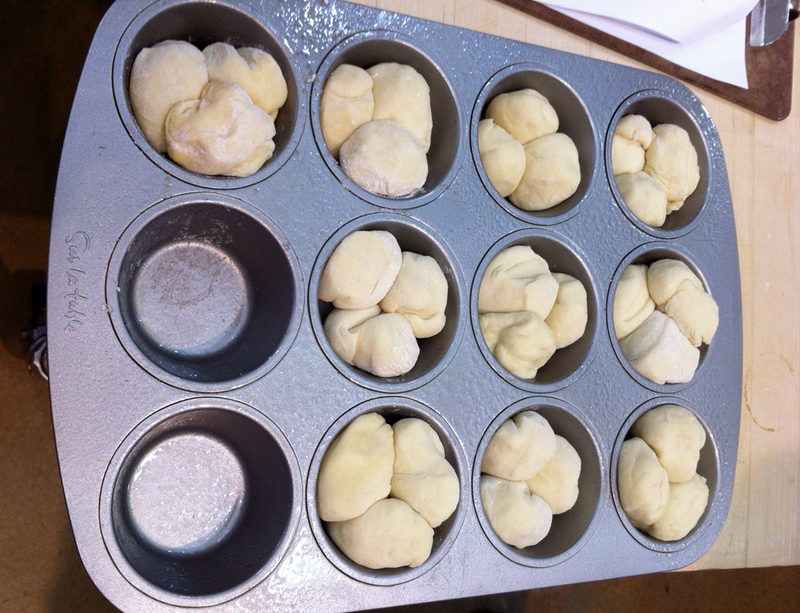 Gently squeeze or kneed the clumps together until they form a cohesive dough. Lightly dust a work surface with flour and pat the dough into an 8x4 inch rectangle. Use a chef's knife or dough scraper to cut the dough in half lengthwise and into quarters crosswise, making 8 - 2" squares. Brush off any excess flour and space them evenly on the prepared baking sheet. Sprinkle the Demerara sugar generously over the tops and press lightly into the surfaces. Bake for 14-15 minutes, until firm to the touch and golden in color. Transfer to a rack and cool for 5-10 minutes. 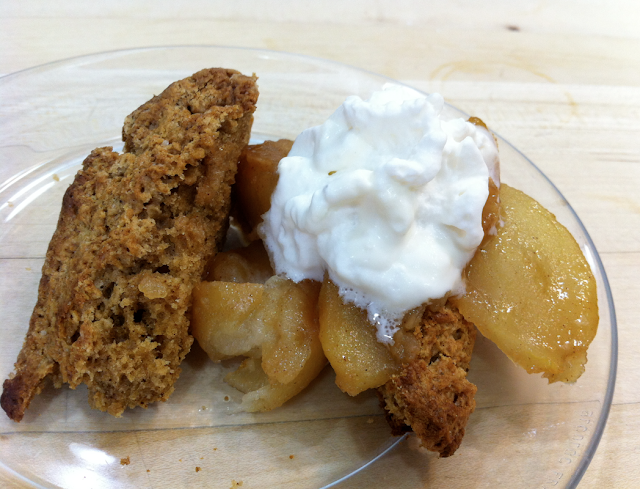 To make the apples, while scones are baking, toss the apple slices with the granulated sugar and cinnamon until evenly coated. Melt 1 tablespoon butter in a large skillet over medium heat. When it has melted, swirl the pan to coat it with the butter, then turn the heat to high, add half the apple slices, and spread in a single layer. Cook, without stirring, for 2 minutes. Gently toss or stir the apples. Cook for 2 minutes longer, then toss or stir again. Continue in this manner until the apples are golden brown and cooked through (the tip of a paring knife should slide easily in and out of the slices), yet still hold their shape, 8-10 minutes total. Transfer to a large plate. Repeat with the remaining tablespoon of butter and the rest of the apple slices. Serve the scones split in half, with the apples spooned over the bottom half of the scone and a dollop of whipped cream on top of the apples, then the top half of the scone set slightly askew on top of the whipped cream. There you have it!! I hope you enjoy these tasty treats as much as I did! 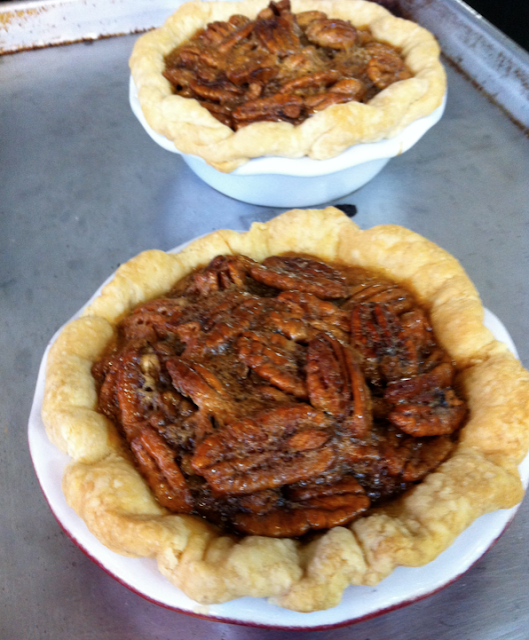 The great part of this class, besides gaining these recipes, was that it included parting gift of our own small pie plate to make the 5" pie shells used for the pecan pies. BONUS! !